It gives a vibrant 5500 lumen picture coupled with an xga resolution best for replacing an existing 4:3 model while not having to replace an older screen. it features a solid 16,000:1 assessment ratio for deep blacks and shading and with the aggregate of a 1.6x optical zoom and each vertical & horizontal keystone correction is also quite flexible for the set up point. Disclaimer : Panasonic PT-VX610 LCD Projector price in Pakistan is updated on daily basis and rate/price for Panasonic PT-VX610 LCD Projector is valid for all cities of Pakistan included Islamabad, Rawalpindi, Lahore, Karachi, Faisalabad, Peshawar, Sialkot, Quetta etc. 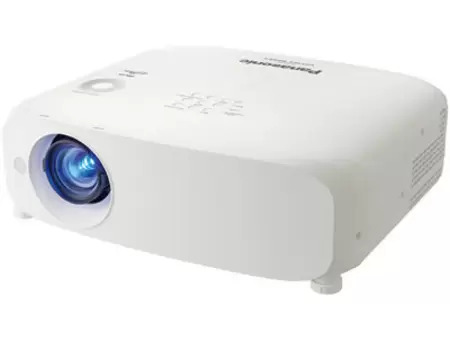 Panasonic PT-VX610 LCD Projector price depends on many factors thats include the price of dollors, manufacturar price and import cost and duties etc. Our team entered specs from diffrent resources and not responsible for any typo error in specs for Panasonic PT-VX610 LCD Projector, please report any such error in bug report panel for Panasonic PT-VX610 LCD Projector. Panasonic PT-VX610 LCD Projector price in Pakistan.